Sealaska Heritage Institute (SHI) has published a new culturally-based children’s book through its award-winning Baby Raven Reads program. The new book, Am’ala, is based on a traditional Tsimshian story about a young man who is teased by his brothers for being lazy and dirty. The young man trains secretly with a spirit and gains superhuman strength. He takes on warriors, animals, and even a mountain before facing his greatest challenge—the world itself. 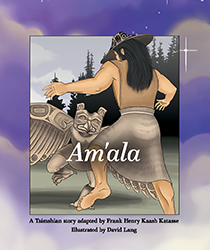 The story was adapted by Tlingit writer Frank Henry Kaash Katasse and illustrated by Tsimshian artist David Lang. Am’ala also is the story illustrated in the monumental house front carved by Tsimshian artists David A. and David R. Boxley on display in SHI’s Walter Soboleff Building. SHI will release the new book at a book signing with Katasse and Lang on Friday, Nov. 3, at the Walter Soboleff Building in Juneau. Am’ala is the eighteenth children’s book published through SHI’s Baby Raven Reads, a program for Alaska Native families with children up to age 5 that promotes early literacy, language development and school readiness. Baby Raven Reads was one of 15 programs in the world chosen for a 2017 Library of Congress Literacy Awards Program Best Practice Honoree award. In 2017, SHI received a grant from the Alaska Native Education Program to expand Baby Raven Reads to nine other communities. SHI—in partnership with Central Council of Tlingit and Haida Indian Tribes of Alaska (CCTHITA) Head Start program—will offer the three-year program in Juneau, Angoon, Craig, Hoonah, Klawock, Petersburg, Saxman, Sitka, Wrangell and Yakutat through 2020.